Our locally made Chanticlear Frozen Pizza’s start with a family secret, thin flaking crispy crust. Our time-tested sauce born out of the Chanticlear tradition blends vine-ripened tomatoes, herbs and spices. We skip the sugar. We layer on fresh vegetables including mushrooms, red onions, black olives, green peppers and red peppers. We use only premium MSG-free meats including natural uncured pepperoni as well as handmade natural sausage. Premium meat = premium taste! And, we’ve saved the best for last, because for many of our Chanticlear fans, it’s all about the cheese! Our 100% Wisconsin mozzarella cheese is grated right off the block daily. Simply said, it melts in your mouth! When you bite into a Chanticlear Frozen pizza, you are biting into a frozen pizza experience unlike any other you will find anywhere, at any price. We love our product, and we have found that when it comes to pizza, people love a perfect pie! We are sampling our pizzas virtually every weekend and the overwhelming feedback is, in a word, AWESOME! In fact at a recent sampling event, we sold out of nearly every pizza at the store! 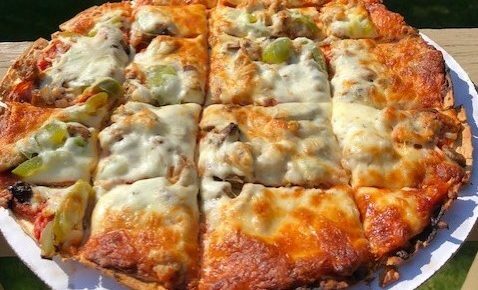 So while there may be other pizzas on the market at lower prices, when you bake a Chanticlear frozen fresh pizza to perfection, there is absolutely no substitute! And let’s be honest, who wants a frozen pizza that tastes, well, frozen! Tasting is believing, and we encourage you to give us a try at one of our demo days, and then bring it home to share with your family and friends. Life is short, so eat great pizza, and we hope you’ll agree that when it comes to frozen fresh pizza, Chanticlear is a slice above the rest! Questions? Contact us for demo days and times, as well as an updated list of store locations where you can purchase Chanticlear Frozen Pizza!